A lot of my bloggy buddies are doing this, so I guess I shall follow suit. June: Getting together with our trach family. We wish everyone a Happy, Healthy, and Blessed New Year. Happy 2010, bring it on!! 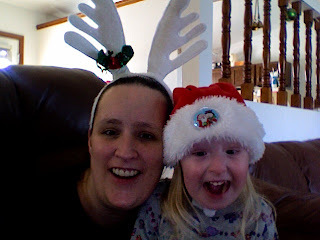 I thought I would share how much fun we had over the Christmas holiday through pictures. Get ready for a lot of them! I wish I got more pictures of Marissa enjoying time with Auntie Katelynn, and Nana & PaPa. She had some good quality time with each of them. She is no longer afraid of people she is not used to seeing now, its more like a shyness. But she hates to have her picture taken so it made for a difficult time capturing any of it on film. I wanted to extend a very special thank you to a wonderful little bloggy buddy elf who sent Marissa and Elmo chair, an Elmo book and Cookie Monster and Elmo figurines. You know who you are. Jeremy and I wanted to let you know that Marissa loved coming down the stairs Christmas morning and seeing her new Elmo chair. She yelled "Elmo!!!!" at the top of her lungs and proceed to pick up the chair and carry it around. She was very proud of it! Thanks again! My Step-Dad, Larry, aka PaPa, with his new big boy toy: 12 gauge double barrel shot gun like the Old West cowboys used on stagecoaches. Thanks for the Elmo Tickle Hands, Bubby and Zeyda! A very Sesame Christmas. Auntie Chelle had an Elmo blanket made with Marissa's name on it! ... for Christmas, of course! All the gifts have been bought and wrapped, the Christmas day family dinner is ready to be fixed, and the stockings are hung by the chimney with care. We are preparing for a fun family Christmas, complete with my sister Michelle, her boyfriend Nate, and my sister Katelynn, Mom and Step-Dad (Nana & PaPa) from Grand Junction. They are planning on being here sometime the afternoon of the 24th and staying with us until Sunday. I am really looking forward to spending a few days with my family. It is going to be crazy fun and relaxing at the same time! I wish we could have our whole family here for the holiday, but we will celebrate with them long distance instead. I figured I would post one more time before the big day and share a couple of pictures. Enjoy! Couldn't find a picture frame ornament for 2008. Any guesses as to why she is so happy?? She is reading a book about Elmo while watching an Elmo video, of course!! Pure heaven!! I hope and pray this Christmas season finds all of you in good health and spirits. I hope and pray you are able to enjoy the coming days with people you love. And, I hope and pray you all take time to reflect on the true meaning of Christmas.